collagraphs with coloured pencil touches - and what is a collagraph? Whilst sorting through old work to store in my lovely shiny new plan chest I came across unfinished pieces that were worth working further on - these 2 collagraphs were put in the 'To Work On And Finish Later' drawer. This morning I got out the coloured pencils and added just a few thin glazes of colour to push the colour range a little and add warm and cool variations. Polychromos pencils work beautifully over the printing inks on Fabriano Rosapina paper. Collagraphy is a printmaking process - in this case the 'plate' was the card used for the mats in picture framing. The lines are simply cut into the surface with a craft knife, the darker areas are where the top surface has been peeled away, leaving a fuzzy surface. The lighter areas are where PVA glue has been painted on - this repels the ink and makes it easy to wipe it off. Before printing, it is varnished with Shellac, a meths based varnish. Oil based varnishes would melt when the ink was applied and the plate would get soggy and disintegrate. The the ink is applied and rubbed in to the cuts and wiped off the surface to leave a thin veil of ink - at this stage it's quite creative and no 2 prints will ever be the same. The way the ink is wiped off and the colour applied is like monoprinting. Then the plate is printed using an etching press - the high pressure is needed to force the ink out of the grooves. The lines print darkest as the grooves hold the ink, the peeled away sections are next in darkness or intensity, the smooth untouched surface can be wiped so that it is as pale as you want and the pva sections are very pale. Applying the ink isn't a totally accurate process so the finished result has a looseness that I like, held together by the incised lines. It isn't possible to use many colours of ink at once either - the second print was simply a deep blue ink and a yellow ink blurred and blended where they met (plus the touches of coloured pencil done later). I really like the moment when you peel your print away from the plate and find out what you have :>) I do want an etching press of my own. Some people stick lace and textured things onto the plate - but for my work I find this a little crude and coarse. I do sometimes use fine threads or fabrics but nothing too clunky. These hold the ink differently and create intersting textures that are indented into the paper of the final print. Another method that I mean to try sometime is one I've read on someone's blog - and I apologise to you but I can't remember who the blog belonged to! If you recognise yourself please leave a message and a link? Anyway, they collaged flat pieces of card/whatever and inked up the plate, wiped it - leaving the ink puddled around the edges of the collaged pieces, and then printed it by hand rubbing it, giving outlines from the shapes used. It is possible to hand print with this technique because there is no intaglio involved (intaglio=cut into the surface marks holding ink) - intaglio processes like etching need high pressure to print, for relief processes, where the ink is on the surface, it is possible to print my hand - though a press makes life easier and I like the way it prints better. I want an etching press! Do you do any printmaking? if so what do you do? 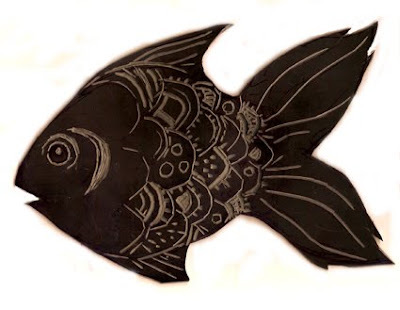 do you have an etching press? 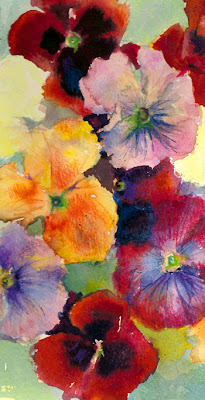 These are great, Vivien - I love the colors and the way you've treated the water in both pieces. Thanks for the very interesting description of the process as well. I haven't done printmaking since high school or college and never felt especially at home with it. 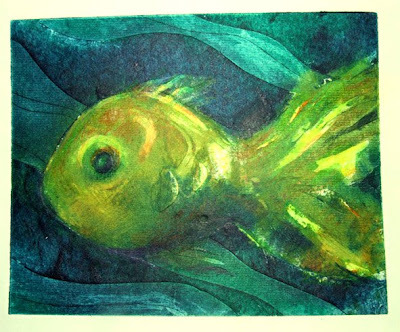 I love the landscapes Degas did with monotype and pastel, though, and these fish of yours are wonderful. I have access to a friend's press, that of my lino teacher. And, because of a pinched nerve, I find hand rubbing a chore and cannnot do much. I love acid etchings, but my house is not really the place for that so I do mainly lino, collograph, monprints and monotypes. For small work, hand-burnishing is fine, but for a big edition I (and probably everyone!) need a good press. 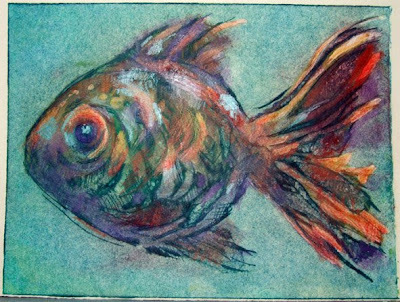 On my flickr site(I am "dinahmow") , in the "art" set there is a collograph before-and- after. So, a table press is OK, a baren is ok, a wooden spoon can be ok. But a big, floor-mounted, geared "squashing machine" is heaven! Glad to see that your 'lovely shiny new plan chest' is filling up. My 'lovely shiny new desk' was commandeered by my grandson this weekend. Got it back again today to set up my next piece. I like to print any method I can. I like to make stamps using high density foam and a soldering iron. Another method I like is to use is using a teflon sheet. BTW - my Blogger site is back in action again!!! This is such an interesting process, Vivien - I once did a print class with children, drawing onto the flat, cut-out bottom of a polystyrene tray with a ballpoint pen, inking it and just hand-rubbing it onto paper - easy for small hands. But then they started rolling far too much ink on, getting it on clothes, tables, walls... oh my oath... Yours is a much more refined method! this is one of my favourite printmaking processes because of the subtlety you can get :>) and it's cheap too! I was just looking for different collagraphs for a schoolproject, and found your site. But I have to say that I love Fish 1. The colors and the shapes are wonderful.